NEO Finance is a P2P investment site based in Lithuania. The site helps to fund consumer loans. It operates on what we would describe as a ‘pure’ P2P basis. Loans are only originated and sent to borrowers once investors have provided the funding. The interest rate is set according to the level of investor demand. Investors have some exposure to losses if loans default (a partial buyback guarantee exists). However, investors receive higher than normal interest rates to compensate for this extra risk. The amount of information provided about each borrower is much higher than we have seen on any other site. At least 12 different data fields are available including income, other liabilities, assets owned, previous debts repaid, and credit score. We have been testing the site for some time and overall believe that the site works well and provides good quality information. There are still some rough edges and areas where the site could improve how it works. For example, the secondary market offers interesting opportunities, but investors can’t choose how much of any loan they wish to purchase. It’s an ‘all or nothing’ approach that makes no sense to us. Some of the processes could also be made more efficient. We’ve given some suggestions to the NEO Finance team on potential site improvements and we are confident that their developers will be able to keep refining and improving their site over the coming months. One area that has particularly impressed us is the transparency of the NEO Finance management team. They publish a very detailed quarterly report (latest one available here) that is very open about the progress they are making as a business and where they are heading. This is a big positive in our view and provides us with confidence in the business and management team. As noted in the interview below, there are several experienced and high calibre executives associated with the company. Overall, we think that NEO Finance is a small but promising site that we would expect many investors to ‘test’ with a small amount of funds, and then grow their investments over time. The high quality of data available, together with the lack of a full buyback guarantee, suits investors looking for high returns, are willing to take some extra risk, and can devote some time to finding the best loans on the site. Hi Evaldas. Can you explain the business model of NEO Finance? We charge a fee to borrowers on their instalment, and collect it when the payment is made. This way, we take the risks together with all investors in getting our money back. You provide loans under your Paskolu klubas brand. What types of loans do you offer customers, and what is the borrower profile? What interest rates do your customers pay? We provide consumer loans; we are more focused on banking clients. Currently, our average APRs for loan applicants are 11.4%, 16.0%, ad 21.5% for ratings A, B, and C, respectively. Average percentages always change, since the market decides the interest rates. We only set the lowest boundaries for each rating. For example, for B rating, the lowest interest rate is 12 percent, but if investors do not want to fund the loan for 12 percent, loan applicants can increase the APR. What’s the background of your management team, what experience do they have? Our Chairman of the Supervisory board Antanas Danys previously was the Chairman of the Board at Swedbank Lithuania. Our Board members include an experienced credit risk specialist, e-money specialist, a former McKinsey consultant, and an entrepreneur and investor. Our CTO, Viktoras Ivanovas has multiple years of experience in developing various internet projects, credit union systems and IT solutions for start-up companies in Lithuania and abroad. Our CFO Andrius Liukaitis has experience at SEB Bank and Finasta Bank. 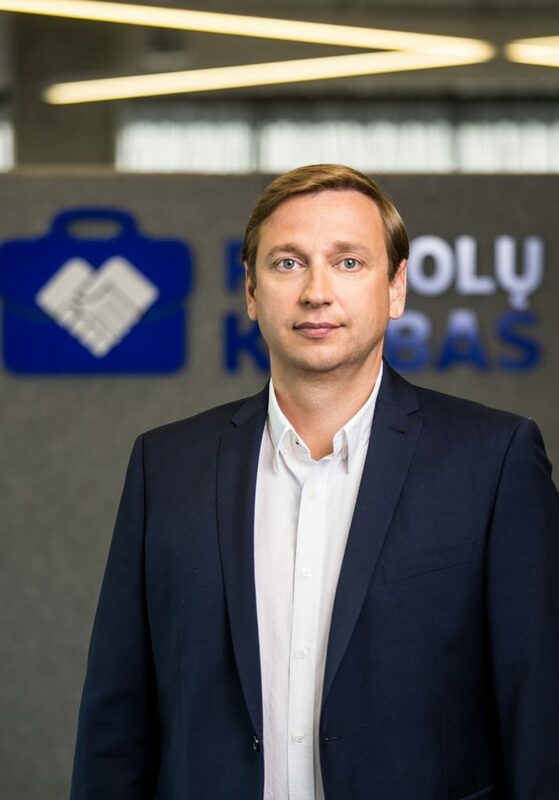 CMO Justinas Kodžius has previously had success helping a Lithuanian lending business become very successful. How do you manage credit risk? Do you rely on credit bureau scores or do you have your own risk models? We have our own risk model created by one of our Board members Marius Navickas, who is one of the best risk assessment professionals in Lithuania. We automatically receive all necessary data from credit bureau, including salary, debt history, etc. What returns have your investors generated so far? If we calculate the average interest rates for each rating, and include the Buyback service (not mandatory to be used, but we recommend it), current net returns on average are equal to 13% [Click here for NEO Finance’s return calculations]. You don’t provide a buyback guarantee for defaulted loans like many other sites do. Can you explain what recoveries investors can expect to receive on defaulted loans, and the different options you provide investors. We do offer Buyback service on defaulted loans, but currently we buy back from 50% to 80% of the defaulted loan amount. The percentage depends on the loan rating and status of investor: (we offer 50%, 60%, and 70% recovery for C, B, and A ratings, respectively. An additional 10% on top of every rating is paid to VIP investors, i.e. those with investment portfolios of €5,000 or more. We do not offer 100% buyback for several reasons. First of all, as opposed to a number of other P2P platforms, NEO Finance itself is a loan originator. This allows investors to invest directly in the initial loan, and not via re-sale, therefore, the investor has more control over their investment, as investors know exactly what APR is offered for every single loan. Also, interest rates for our investors are higher than for the loans with buyback service currently on market (18% on average). In addition, we also offer provision fund service, where one can “insure” their investments for a certain fee. In this case, investors receive lower returns, but the 100% buyback is guaranteed. So, every investor has 3 options for investing and collecting: with provision fund, use our buyback service or wait for the defaulted loan to be collected. What options do investors have when they invest on your platform? Is it simple or complex? While in the market, investors can see all the information necessary to make the “invest or not” decision: they can choose from the three credit ratings, i.e. the already mentioned A, B, and C, they can see the aim of the loan, etc. And we have been praised for our user-friendly interface. Therefore, we can gladly say that investing via our platform is really simple. After observing all offerings in the market, the investors have a couple of options: First of all, they can invest manually, picking out every single loan by hand. However, after they get to know the platform and its possibilities better, we highly recommend the investors to create several automatic investment rules, and let the algorithm do the job. What is unique with NEO Finance, is that we are the only P2P lending platform in Lithuania that offer automatic investment possibility in secondary market. Is there enough loan supply for new investors? How long does it take for funds to be invested across many loans? We are here to make sure there is enough loan supply for both new and established investors. Therefore, we not only invest considerable money to marketing, but also have a dedicated team that works exclusively on supplying loans to investors. We are a well-recognised brand in Lithuania, therefore, our funding period on average is only 1 to 4 days, even though theoretically, it can take up to 14 days. Again, it all depends on the APR, investors’ appetite, and other factors. What is the financial position of NEO Finance? Are you profitable? We are not at profit yet. Mainly, this is so because we invest a whole lot in our IT system. Our revenue has been growing stably, and our expenses have been managed well, therefore, we forecast our cash flow to break even during 2019. What licences / authorisations does the lending business and NEO Finance platform have from the Lithuanian authorities? NEO Finance is the ﬁrst and, so far, the only Lithuanian P2P lending platform operator to hold the unlimited e-money institution licence which allows operations in entire European Union. This ensures constant supervision by the Bank of Lithuania. Furthermore, this allows us to open IBAN accounts to all our users free of charge, and, most importantly, separate the money of NEO Finance from that of investors. Also, we are included in public lists of the Bank of Lithuania: List of Peer-to-Peer Lending Platform Operators and List of Consumer Credit Lenders. Our main plan and goal is to scale up. We are working hard on increasing our volume. This is the reason why NEO Finance has been established on an international level: to offer investment opportunities to foreign investors. Of course, in the future, we are planning to offer loans to borrowers in other countries, as soon as the legislation is established. And we hope that we will succeed! NEO Finance is offering Explore P2P readers a special sign up offer for a limited time. New investors receive a €40 welcome bonus. Simply register and make your first investment (including the €40 bonus) within 30 days. To qualify for this offer, visit NEO Finance using this special link, and you will automatically qualify for the bonus.